Miami Dolphins wide receiver Kenny Stills believes the NFL could take a first step towards ending the player protests by displaying more support to Colin Kaepernick and Eric Reid. Stills continued to kneel during the national anthem - a move taken by several NFL players to demonstrate against social injustice and police brutality - when pre-season got under way this week. Kaepernick was the first man to carry out this form of protest - with ardent support from Reid - with neither now playing in the league. 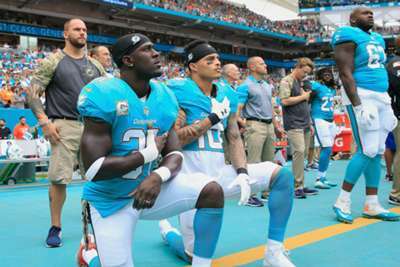 When asked what it would take for him to stop kneeling during the anthem, Stills told the Palm Beach Post: "What would it take? It would take a lot. "But I think a good first step for us as a league would be acknowledging what they’re doing to Colin Kaepernick and Eric Reid. You can't say as a league that you support the players and the protest and then blackball the players that initially started the protest. Both Kaepernick and Reid have been unable to find a job since becoming free agents. Kaepernick last played in the NFL during the 2016 season, while Reid has been on the market since becoming a free agent in the off-season. Kaepernick launched a collusion case last year against the NFL and its owners, alleging teams made a co-ordinated effort to keep him out of the league because he initiated the protests. Reid also filed a grievance of his own in May.